If you are like us, there really just isn't a lot of extra space in your house - especially for things like a home office. Because of limited space we have to be creative about how we use every inch - especially for things like paperwork, mail, office supplies, etc. Those things can take over your home quickly if you let it - and I'm speaking from experience here. I have absolutely loved taking a little time during each week to start getting our whole house organized. For us, we decided to take it a little bit at a time - so we wouldn't get overwhelmed and just give up. This has been the best way for us - we are actually getting organized and so far have really stuck with it. Its been easy - way easier than expected. So today I wanted to show you our completed "home office" - which is really a little desk area in our kitchen. Its now organized and ready to actually be of use instead of being avoided. So lets go back for a minute and remember the original state of this deak - it was a disaster. The mail and paperwork runneth over. I got to work by emptying everything out and sorting through all of the paperwork and little items that were shoved in. You can find my post on sorting through the piles of clutter here. Now all of the shoved in paper work has order and has been filed away in a pretty file box - which gave tons of space for actual office type supplies like envelopes, notebooks, clips, etc. I'm so excited about this desk now - I like to just walk by and open it every now and again just to look at all the organized goodness. Oh, I also lined the bottom with some scrap book paper and ended up painting a few places inside the desk, just to pretty it up a bit. Just like the top, everything was cleared out and sorted through. Some things were thrown away because it was just junk, some things were returned to its proper place and some things went back in. 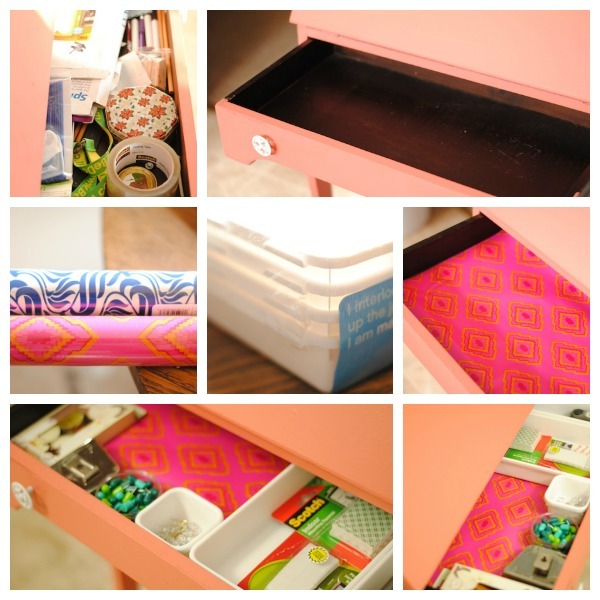 I found some pretty wrapping paper (Target) to line the drawer with and some interlocking trays (from Homegoods) to organize everything when it went back in. 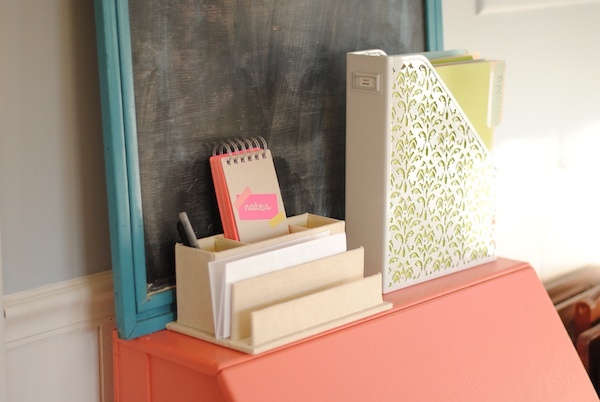 Another addition was this mail sorter for the top of the desk. One section is for incoming mail and one is for outgoing. 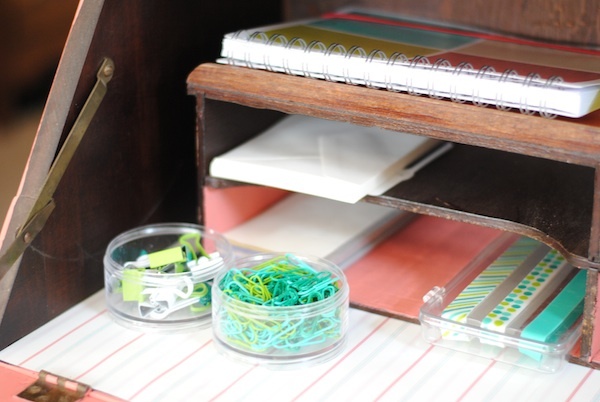 I found the little notebook and mail sorter at Homegoods as well. The notebook was $2 and the mail sorter was $5.99 - not much of an investment for something that will be a huge game changer for us. 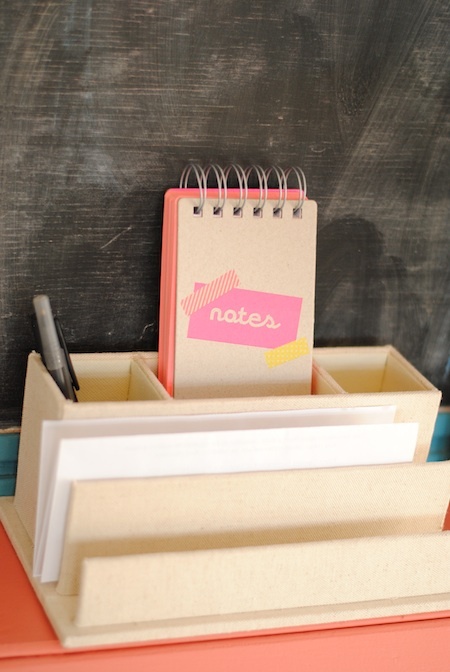 I love that you can find pretty office and organization supplies these days. Well, I think we can call this project complete for now. For under $20 and a few hours time we now have a functional, organized and pretty home office space. I.love.this. 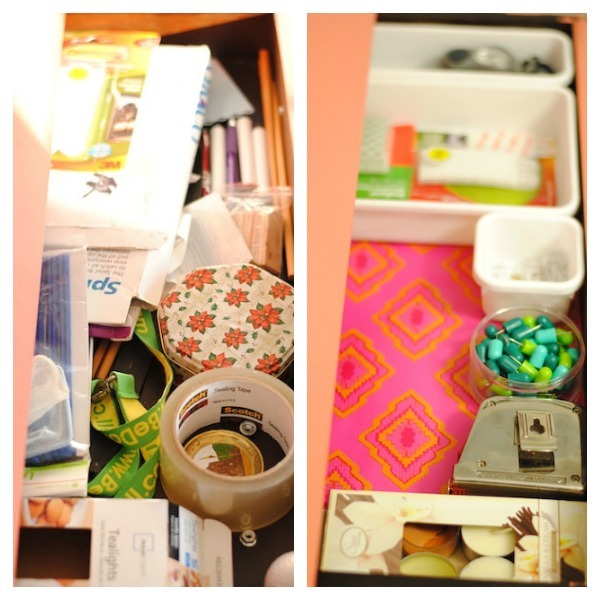 I'm linking up with Jen at I Heart Organizing and her Home Office Challenge. 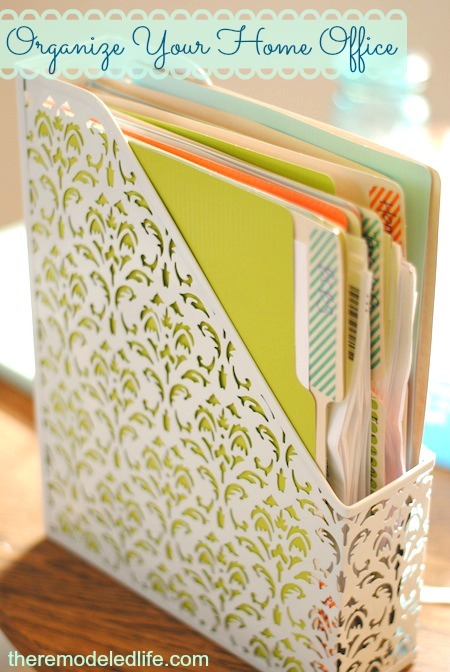 Jen is like the queen of organization, I love her blog and have gotten a ton of inspiration and ideas from her. If you have been on the organization wave like me, you should definitely go check her out!! Thanks for stopping by today! I hope everyone has been safe as the strong storms have come through. Have a great day! Looks great! I love all of the colors in your office. I'll have to dedicate one day to getting this done. Thanks Shaina! I was so unsure about painting that desk the coralish color - but I absolutely love it. Its such a great feeling to have that space done - it didn't take as long as I thought it would. This is awesome! See, our desks started out pretty much the same way. ;) I LOVE the lace-looking magazine holder. Beautiful colors, too! Love, love, LOVE!! So much more organized! It looks great. I love the colour that you painted the desk. So cheery! I sometimes read Jen's blog too. 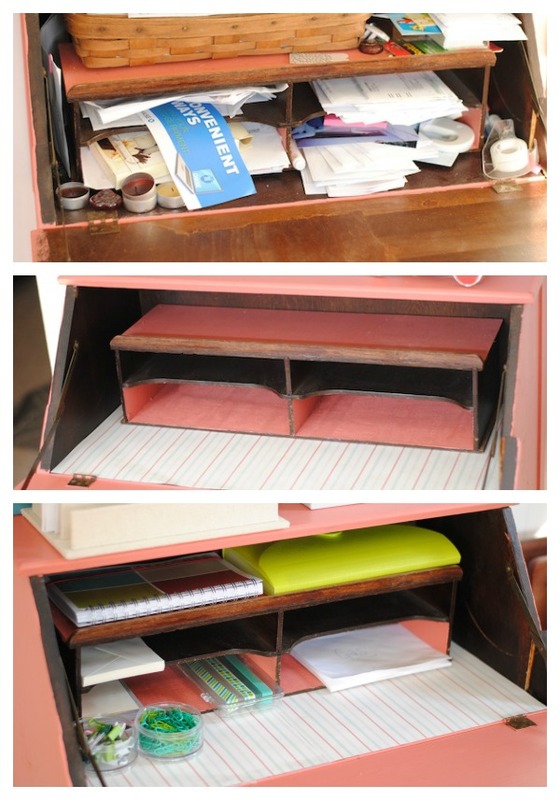 It totally motivates you to get your stuff organized! Thank you Antonella! 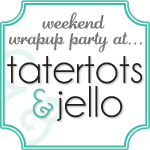 Jen is so great- I get lost in her blog all of the time! love the desk and the coral color you chose is beautiful! Thanks so much! I went out on a limb (for me) for the color but I love it! Thanks for stopping by today! So pretty, Megan! I love the colors. I am in the midst of decorating my new craft desk and space and I feel like I am making slooooow progress! You truly made the most of that small space! 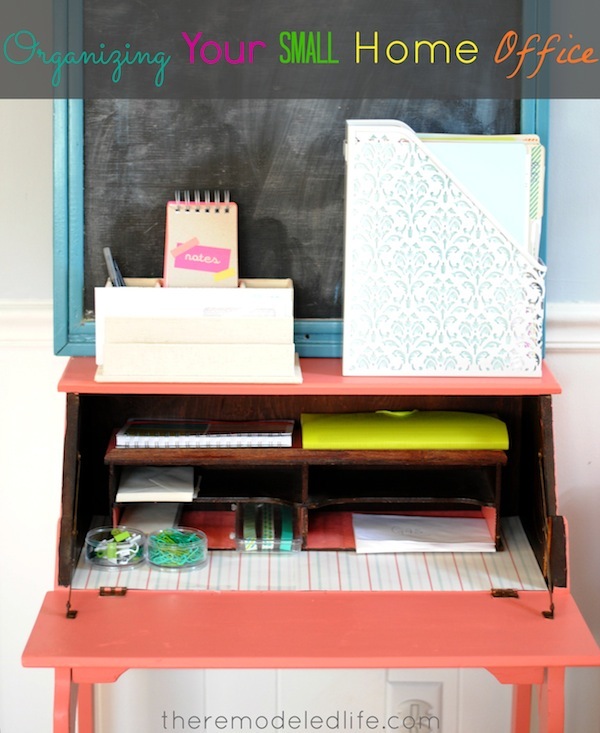 I love all of the happy pops of color and the lined drawers! Great great project and before and after! hi there, would you be willing to share that super fun coral paint color your chose? i would love to know where to find it! thank you, and i love the entire color scheme! Hey Lizzie! The color is called Cranapple by Olympic. Thanks so much!